I know. You are all just itchin’ to find out how we are getting from point A to point B on this island. Well, itch no more, because not only will I TELL you, I’m also giving you the visual. We have been traveling in comfort on this lovely bus. There are only 16 of us, plus our guide, so we have LOTS of room to to spread out. The view from these huge windows has been amazing. 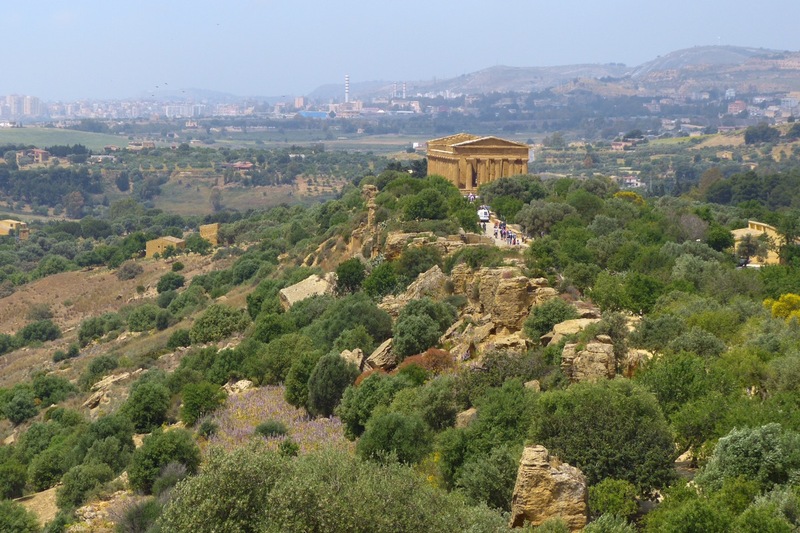 We definitely chose the right time to visit Sicily–the wild flowers are blooming, everything is lush and green, and the temperature has been perfect! 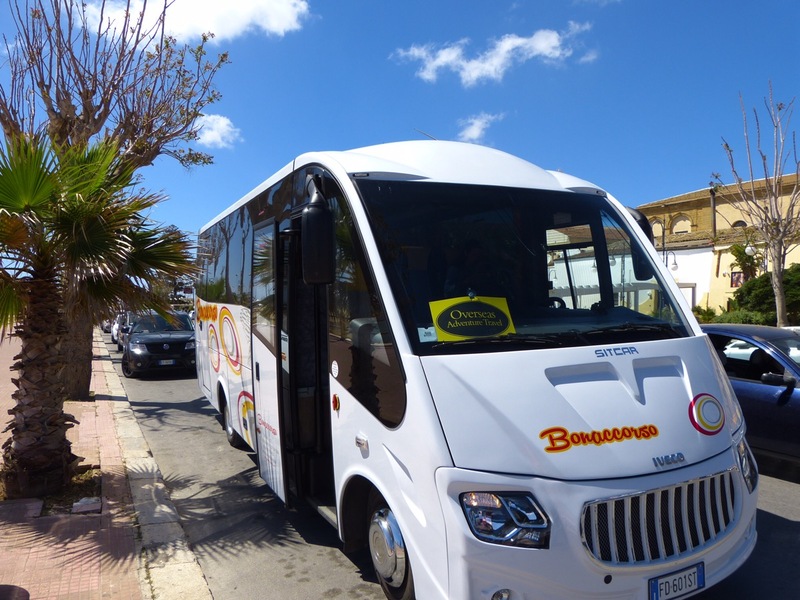 We are all so grateful that Marco, our bus driver, is manouvering along these winding, VERY narrow roads, up and down the hillsides. All we had to do is sit back, relax and take it all in. Once again, we will be time traveling, all the way back to Ancient Greece. I don’t know why, but I just got a flash back to Mr. Peabody and his boy, Sherman, of the Rocky and Bullwinkle Show. (“Every dog should have a boy”. God, I loved that show! ) How sad that so much of my knowledge of history, at least what stuck, came from cartoons and Walt Disney! But I digress. When we arrived at the Valley of the Temples, we were greeted by another Marco, our guide for the site. 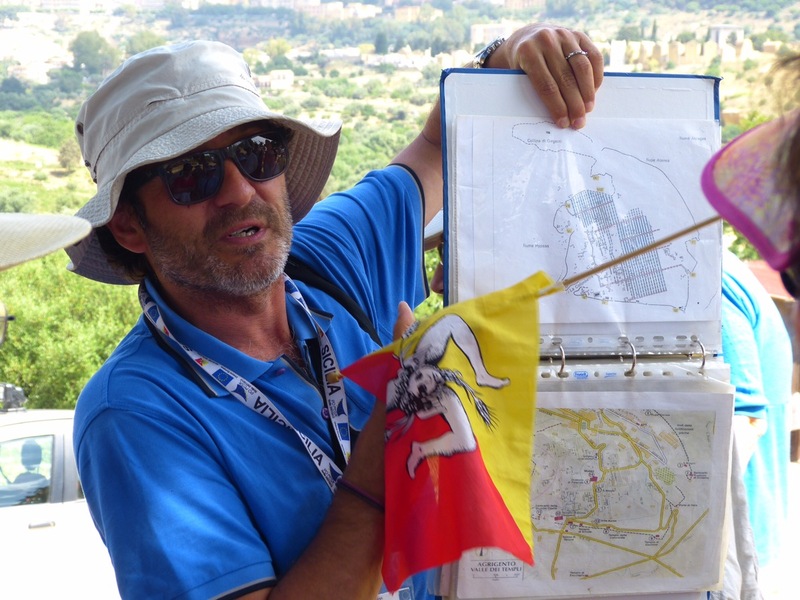 An archaeologist, he came equipped with maps, diagrams, and an abundance of enthusiasm. 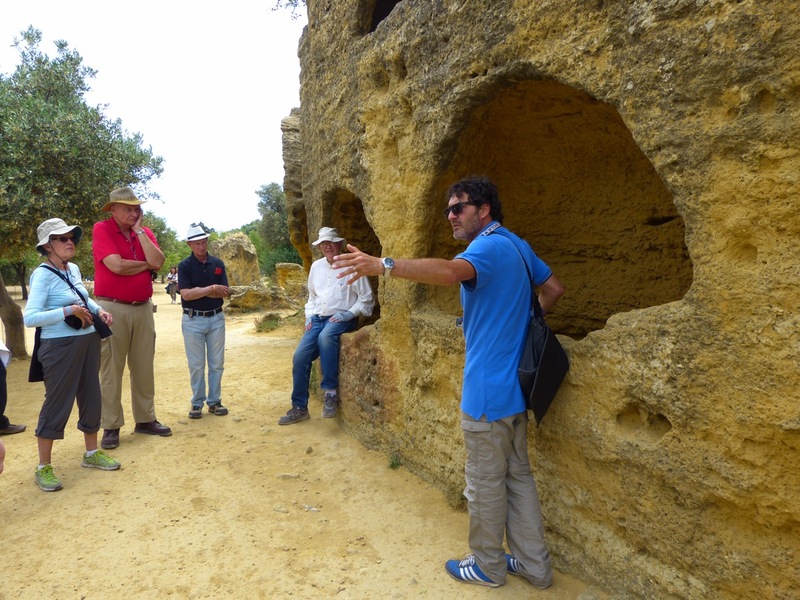 Sadly, the site had been picked clean by those successive waves of conquerors, so it was difficult to extract much information about the lifestyle of the original Greek inhabitants of Akragas (as the area was once known) from artifacts, bones, shards, etc. 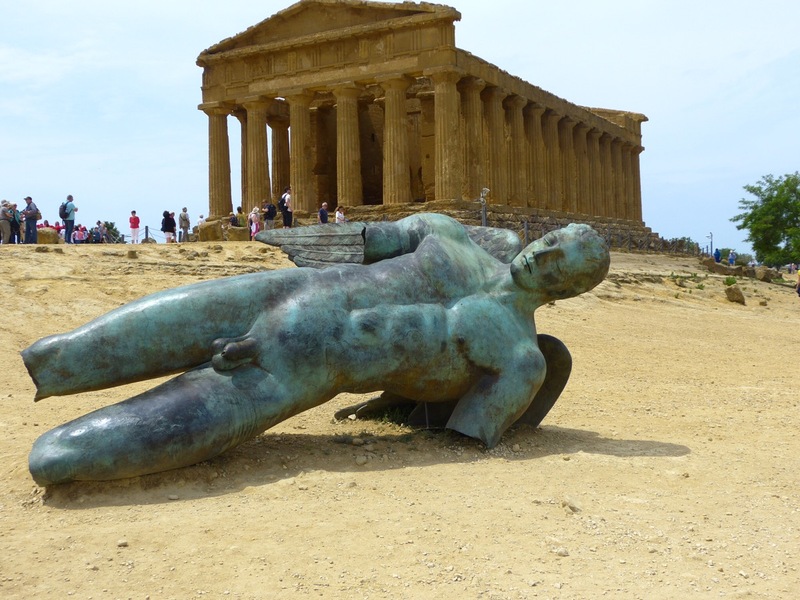 Fortunately, though, eight Greek temples remain at this UNESCO site, all built between 510 and 430 BC. The best preserved temple, called “Concordia” by the non-archaeologists, (because the archaeologists didn’t have sufficient info to determine the correct names of the temples) was saved from being scavenged by the locals because it was transformed into a church by the Normans. Walls were built between the pillars, and the entrance was changed, then at some point (and yeah, I forgot what Marco said. Sorry!) it was all changed back. What Marco COULD tell us was that these arches were once the entrance to Greek tombs, that were later repurposed by the Normans for shelter, with the actual grave used as a manger for their animals. The Greeks dug shallow graves — only about a foot and a half deep– and covered the hole with rocks. Who knows what the Norman’s did with the remains they found when they moved those rocks! My favorite part of the site, however, was this incredible sculpture of Icarus, who fell from the skies because he flew too close to the sun. Clearly, HE hadn’t been under water for 2,000 years! Also clear was that he was a modern addition to the site. After our tour, it was time for lunch at this lovely private home. You’d think we would have figured it out by now. 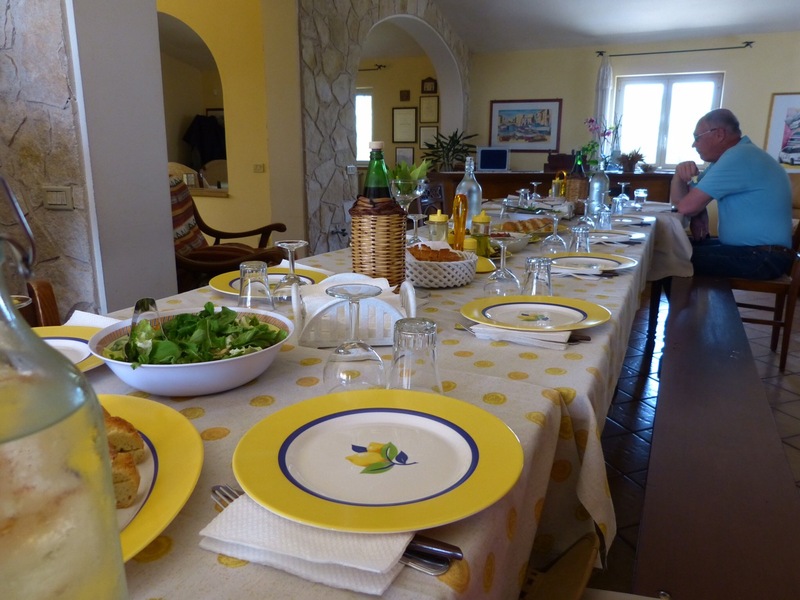 What we THOUGHT was the lunch, was actually just the antipasto, followed by several other courses. We have concluded that we need to get much better at pacing ourselves! But if the food wasn’t enough, there was yet another surprise in store for us: The owner’s grandfather had been a renown craftsman, creating donkey carts that were truly works of art. 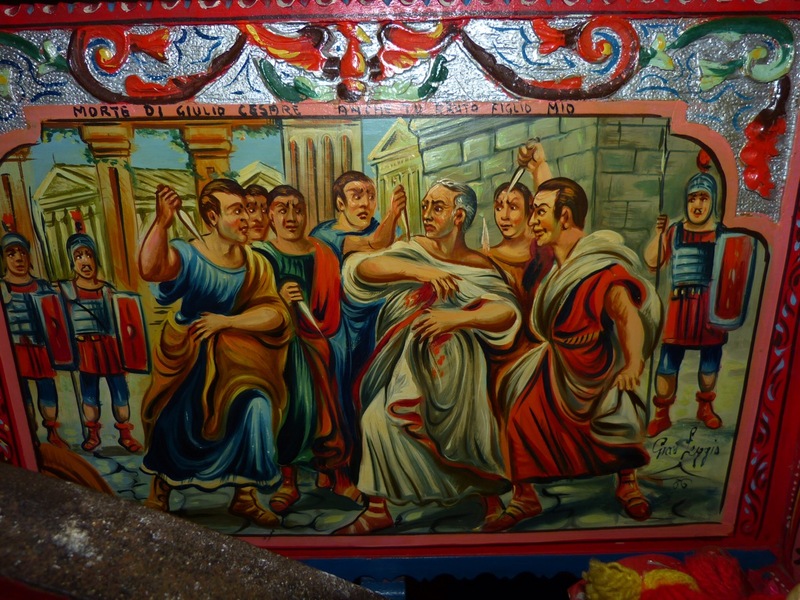 The paintings on the sides of the carts were of historical events, like this one depicting the assassination of Julius Caesar. 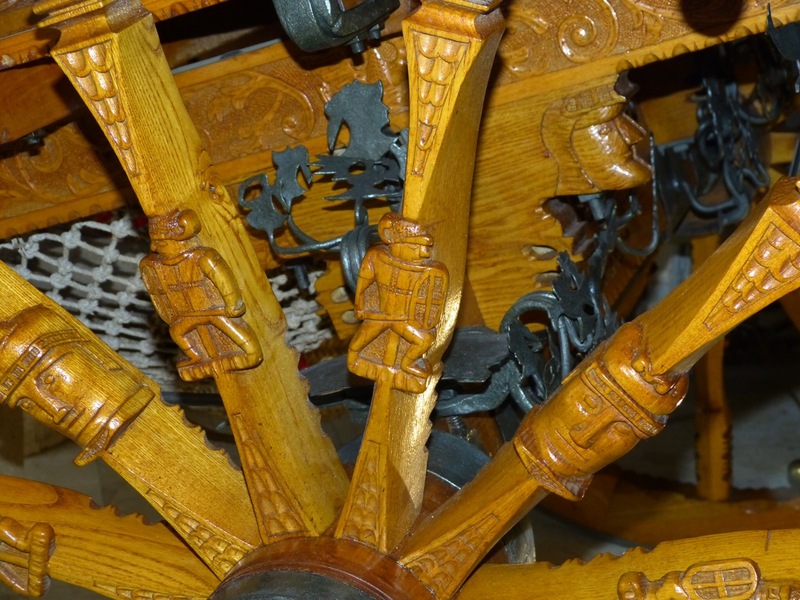 Even the spokes on the wheels were intricately carved. Here’s our hostess, who also functioned as guide, cook and server. These magical interludes are a big reason that Mike and I travel with OAT. We NEVER would have been able to arrange for some of these fascinating encounters on our own! 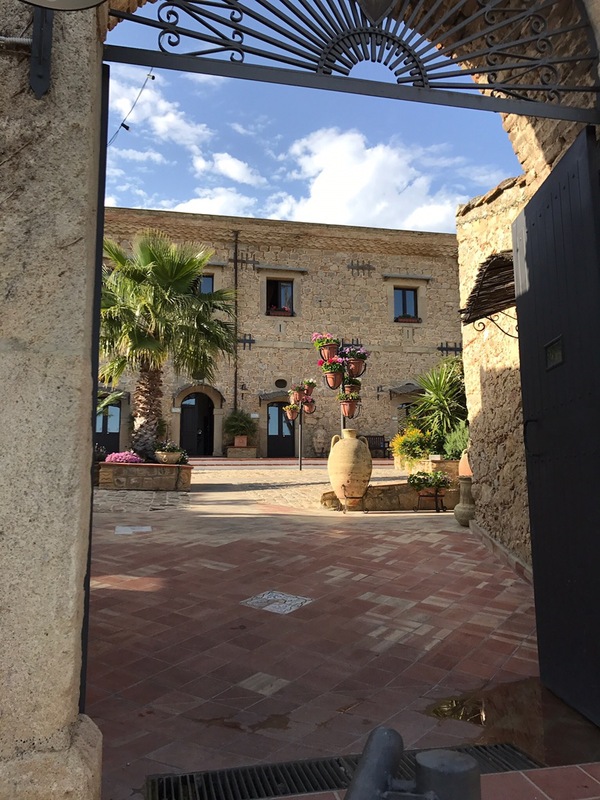 By now, we were completely sated with food and culture, ready for our one night stay at Vecchia Masseria in Piazza Amerina. And yes, it really WAS that beautiful. Another agritourismo, in a pastoral setting with delicious, locally sourced food. Life is good. I am so enjoying your trip and so sad I couldn’t make it myself, boo hoo. But your blog is a great substitute for the actual experience. Thanks! Thanks Nancy. I wish you were here too! We will just have to figure out someplace that we want to visit, and make our plan. We WILL travel together eventually. I’ve decided I prefer OAT to Road Scholar, by the way. Your posts have really encouraged me to look into OAT for future travel. I vacillate between wanting to travel on our own and having everything arranged. There is something to be said for both, but I agree that certain experiences can only be had on a formal tour. We love doing both. The OAT trip just ended and we are now on our own in Malta. If you do decide to investigate OAT, let me know. I can share some tips with you. What a marvelous trip you are having; and your words and photographs take us right along with you. I loved the donkey carts. I’m so glad you are enjoying my posts, Janet.